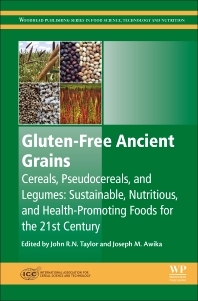 Gluten-Free Ancient Grains: Cereals, Pseudocereals and Legumes covers grains that are not related to wheat. This includes sorghum, the major millets - pearl, foxtail, proso and finger millet, as well as teff, the major pseudocereals - quinoa, amaranth and buckwheat, and emerging legume grains - lupin, cowpea, Bambara groundnut and marama beans. These are all characterized as gluten-free grains. The book provides key information on the sustainable production of these grains. Ancient grains are characterized by their ability to produce a crop under harsh environmental conditions where the major cereals are not-sustainable or even fail. In order to meet growing food demand, and with water resources becoming scarce, this is a highly valuable quality. Chapters review the major grains, analyzing their production and manufacture processes and detailing their impact on long-term good health. Of interest to many people and organizations in the food production chain, this book will be of significant value to agricultural scientists, food company innovation and R&D managers, academic and food company nutritionists and dietitians and governmental and non-governmental health ministries and research institutes. John Taylor is Professor in the Department of Food Science and is Research Theme Leader for Functional Biomolecules and Foods in the Institute of Food, Nutrition and Well-being at the University of Pretoria. He undertakes research into the quality and processing of African cereal grains, especially sorghum and millets in four interrelating areas: grain quality, with specific emphasis on nutritional quality, malting and brewing, gluten-free baked goods, and protein-based biomaterials. Joseph Awika is Associate Professor at Texas A&M University. His research focus is grain chemistry and biochemistry - identifying mechanisms by which secondary plant metabolites and minor grain constituents can be optimized to improve food quality and human health. Dr. Awika’s current research investigates synergistic interactions of specific grain polyphenols in food matrix, and effect of complexation of the polyphenols with starch and proteins on macronutrient digestibility and functionality. He is heavily involved in international research activities aimed at improving nutritional, health and food-processing quality of cereals and legumes with the goal of reducing poverty and preventing disease in Africa.